Easy to follow instructions can be found in your testing kit. 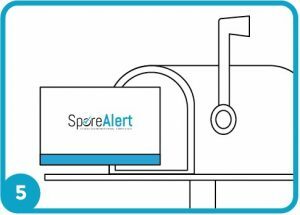 You can open a printable PDF of our SporeAlert Instruction Card or see below for more detailed instructions. 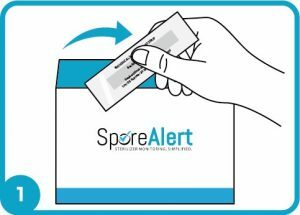 Remove the test strip(s) from the open pocket in the mailing envelope labeled TEST. Please do not open the control sleeve. Please do not remove the strip from the wrapper. Single Strip Kits: Place the test strip in the center of your sterilizer along with a typical load. Multi-Strip Kits: Place your second strip in a hard to reach area, usually the back of your sterilizer. 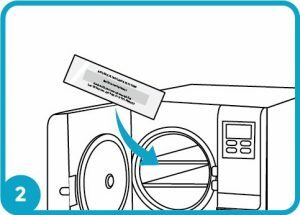 If your sterilizer has a fan unit inside, you may want to secure your strip to a surface with autoclave tape or a paperclip to ensure it doesn’t move during the cycle. Sterilize according to normal procedure. After the cycle is complete, place the strip back into the sleeve in the mailing envelope and seal. Don't know what parameters to use? Guidelines for sterilization cycle parameters can be found in your manual. 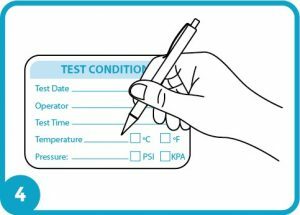 (OPTIONAL) Record the test conditions on the mailing envelope. This can help you keep a detailed log, as well as help diagnose any issues if you get a positive result. If you do not enter information here, these fields will be blank on your report. 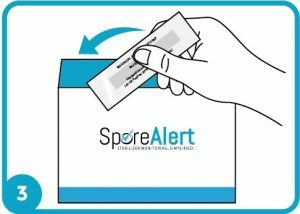 Please mail back your test envelope promptly after running the strip through your sterilizer. After we receive your envelope in the mail, the strip will be set in media and incubated for 7 days. After the incubation period, your results will be available to view online. If you get a positive result, you will receive a phone call from us informing you of the next steps. This may occur sooner than 7 days. 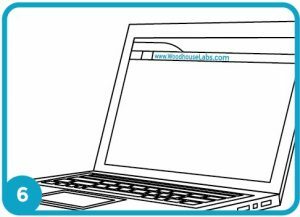 From your account page you can download and print individual test results, or a summary of your results for your records. Still need assistance? Get in touch!